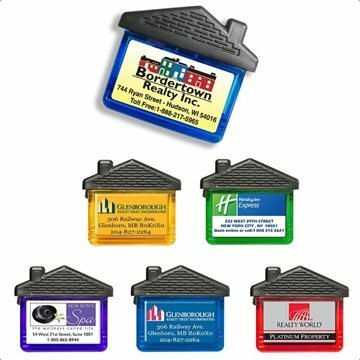 This house shaped memo clip is a great giveaway for educational institutions, real estate agencies, mortgage brokers and more. Have your company name or logo printed using a full color process epoxy dome print. This note holder comes in translucent colors and features a magnetic back to attach to any metal surface. Overall I like the product a lot. The artwork came out great. the finished product was perfect!!!! Very neatly packed and sell ready. I ordered this as a 'thank you' gift for basketball & cheer coaches and like it. Perfect job! Same product with better imprinting and lower in price than others we have used in past! they showed up just in time for our event and of course, Rosa was awesome! The price is reasonable enough that we let everyone keep the crayons. Great buy.